After two Oregon newlyweds are robbed and murdered in their car by a hitchhiker, police release a photograph of their prime suspect, ex-convict Emmett Myers. 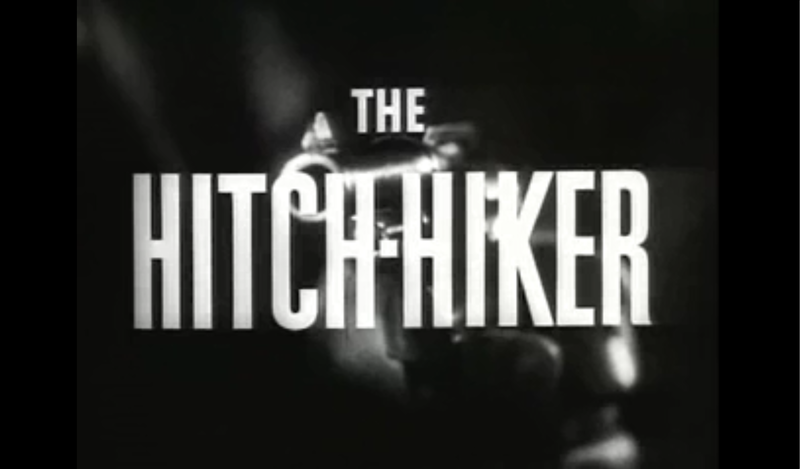 The hitchhiker then kills and robs a salesman in central California. Soon after, two Arizona men, draughtsman Gilbert Bowen and garage owner Roy Collins, drive across the California-Mexico border on their way to a fishing vacation in Baja. Once past Mexicali, Roy and Gil offer a lift to a stranded stranger. Almost immediately, the man, Myers, pulls out a gun and forces them to stop on a side road. 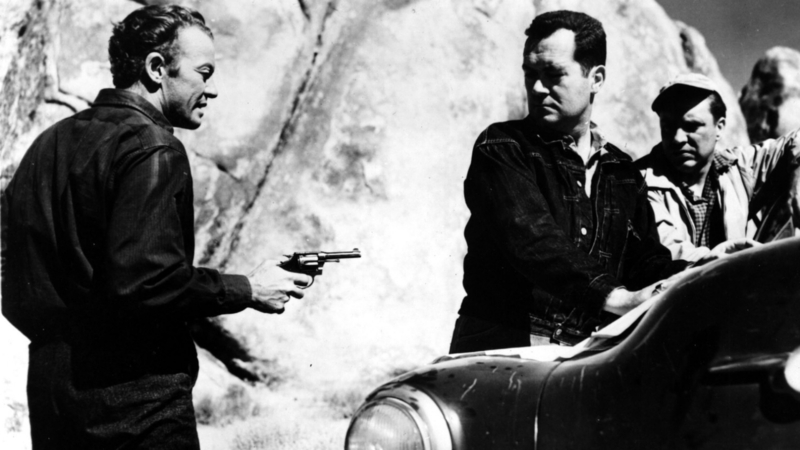 Myers, who freely admits his identity, confiscates Gil’s rifle and ammunition, then orders them back on the highway. After warning Roy and Gil not to “get smart” like his previous victims, the excitable Myers demands to know when their wives expect them home. To keep Myers calm, Roy responds that they are not due back anytime soon. Later, while stopped for gas, Gil starts conversing in Spanish with the non-English speaking attendant, and Myers, who does not understand Spanish, flashes his gun at Gil to keep him quiet. At the next deserted side road, Myers studies a map and decides he is going to catch a ferry in Santa Rosalia, 500 miles away. Myers then shows off his shooting skills and forces Gil to fire his rifle at a tin can that Roy is holding hundreds of feet away. Gil’s shot hits the can, but both men are shaken by the incident. Pushing on, the men hear a radio report about Myers, which indicates that the police do not know the killer’s current whereabouts. That night, the trio sets up camp, and Myers advises Gil and Roy not to try to escape, as one of his eyelids does not close and therefore they could not know for sure if he is sleeping. The next morning, the men drive to a small town to buy provisions. Once again, Myers warns Gil not to speak Spanish to anyone, and his nervous behavior in the general store attracts the proprietor’s attention. Later, over lunch, Myers brags about his toughness and accuses his hostages of being “soft.” Myers then hears a radio report announcing Gil and Roy’s disappearance, and during a moment alone, the hostages discuss escape plans. Soon after, on the road, the car horn starts to blare uncontrollably, and Myers orders Roy, the driver, to pull over. As Roy works under the car’s hood, Myers becomes agitated when a man with a burro passes nearby. Roy fixes the horn, then later while driving, is slugged by Myers because the radio is no longer working. After Gil convinces Myers that the surrounding hills are interfering with the radio’s reception, Myers calms down. At a Baja police station, meanwhile, a Mexican official tells an American agent that they have received information about the hostages and their car from the store proprietor, and both lawmen agree that Santa Rosalia is Myers’ likely destination. Back on the highway, Roy’s car gets a flat tire, and when a couple stops to offer Roy and Gil assistance, a hidden Myers signals to them to keep quiet, arousing the couple’s suspicions. Soon after, police captain Alvarado, who has been tracking Myers, questions the couple and is directed to the spot where Roy’s tire was changed. That night, Myers, who has heard a radio broadcast about the police manhunt, forces Gil and Roy to steal fuel from a gas station. While investigating at the station the next day, Alvarado discovers Gil’s wedding ring, which Gil had slipped off and left. With this latest evidence, the police decide to disseminate false information about their activities over the radio. Myers, Roy and Gil, meanwhile, set up camp again, and during the night, Roy and Gil attempt to flee. Myers quickly catches them, and in the morning, takes them to a deserted mine shaft. Myers is about to force his hostages into the shaft when he hears the false police report on the car radio. 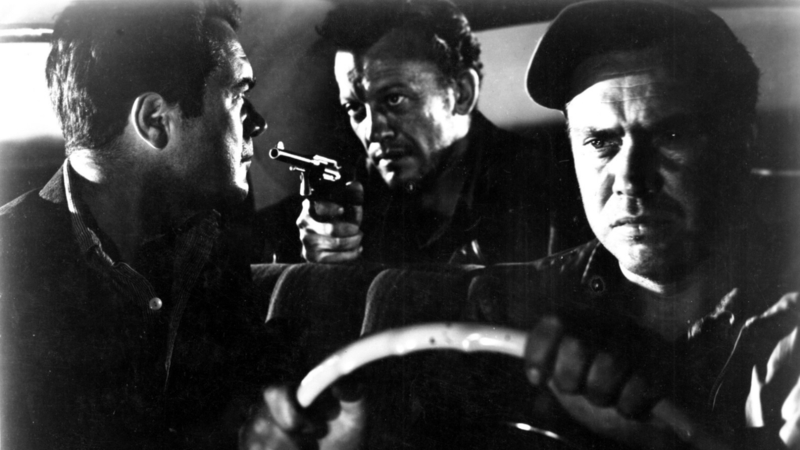 Assured by the broadcast that the police are not close, Myers decides to spare Gil and Roy, but soon discovers that the car’s crank shaft is ruined. Myers insists that they walk the last miles to Santa Rosalia and orders Roy, who is on the verge of a breakdown, to change clothes with him. When they finally stumble into town, Myers offers to buy his hostages beer, and in the cantina, learns that the ferry he was planning to catch has burned down. Through Gil, Myers arranges to hire a boat to take them to Guyamas that evening. Shortly before they depart, however, the bartender sees a wanted poster of Myers and notifies the police. When Myers arrives at the dock with Roy and Gil, Alvarado, who is hiding among the boats with other police officers, yells at him to freeze. Worried that the police will mistake him for the killer, Roy jumps the startled Myers and fights for his gun. During the struggle, the gun falls in the water, and Alvarado finally apprehends the correct man. While leading Myers away, Alvarado informs the relieved Americans that he will need a full report in the morning. Categories: Movies, Store, Videos | Tags: Classic Movies, Download, Edmond O'Brien, Film Noir, Stream, Streaming, Suspense, Vintage | Permalink.